This easy Caribbean rum-soaked cake recipe starts with a yellow cake mix and instant pudding. 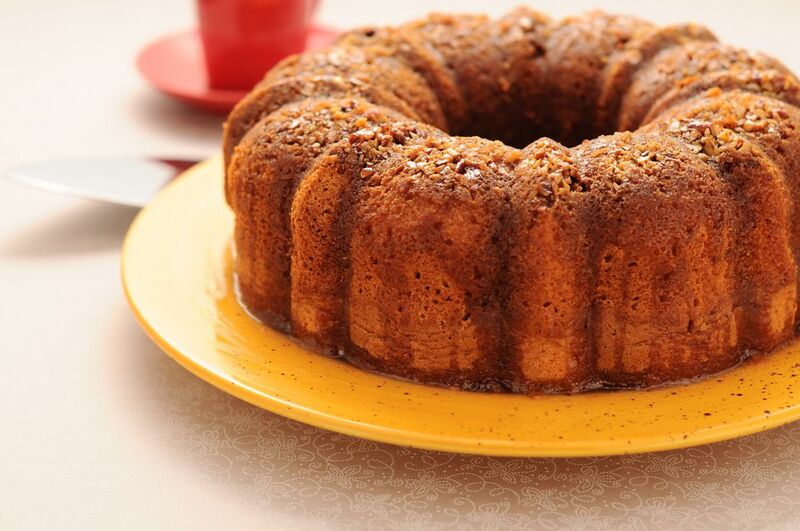 You will make it in a Bundt pan so it will be able to soak up the delicious glaze made from Bacardi dark rum. While the rum added to the cake batter has the alcohol cooked off, leaving the rum flavor, the rum glaze retains most of the alcohol. Because of this, use caution and alert any guest who wishes to avoid alcohol. Rum was a driving factor behind the Caribbean’s economy, history, and culture. By the late 17th century, a thriving export trade developed. Rum is produced by fermenting sugarcane juice and byproducts such as molasses, then distilling the alcohol and aging it in oak barrels. Not only is the alcohol used for cocktails, but it is also used for preserving and cooking, too. Almost every major Caribbean island group produces its distinct style of rum. This recipe calls for Bacardi rum, but you can use your favorite brand. Note: while there are multiple steps to this recipe, this rum cake is broken down into workable categories to help you better plan for preparation and baking. Thoroughly grease and flour a Bundt pan and set aside. In a large mixing bowl, combine cake mix, pudding mix, eggs, water, oil and 1/2 cup dark rum. Mix by hand or an electric mixer until the batter is smooth. Bake for 1 hour. Remove the cake from the oven and allow it to cool for 20 minutes. Invert the cake onto a wire rack and let it cool completely. Transfer the cooled cake to a serving platter. Using a fork or toothpick, prick the top of the cake to form small holes that will absorb the rum glaze. Whisk in the water and sugar. Slowly bring the sugar and butter mixture to a light boil and cook for 5 minutes, constantly stirring. Remove the sugar mixture from the heat and stir in the rum. Allow the glaze to cool slightly before glazing the cake. Drizzle and smooth some of the glaze over the top and sides of the cake. Allow the cake to absorb the glaze and then repeat until the glaze is gone. Serve the rum cake as is or with a scoop of vanilla ice cream or a dollop of freshly whipped heavy cream. Caribbean Christmas Cake Recipe: This cake is known variously as black cake, wedding cake, and great cake made with aged rum-soaked fruits. It's a special dessert served at Christmas, weddings, christenings, baptisms and significant anniversaries. Polish Rum-Soaked Babka Recipe: This yeast cake is soaked with a rum syrup and is a traditional offering for the Easter holiday. French Baba au Rhum Recipe: This yeast cake features orange and lemon zest, while vanilla is added to the rum soaking syrup.